Arsenal striker Pierre-Emerick Aubameyang has scored from the penalty spot to make it 2-0 against Manchester United this evening. 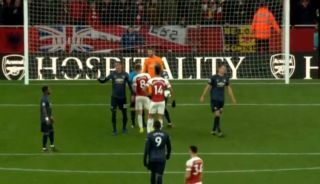 The Gunners had a strong first half but looked to allow Man Utd back into the game in the second period until this slightly lucky spot kick award from referee Jon Moss. As you can see in the video above, Alexandre Lacazette seemed to have been brought down by Fred after a driving run into the box. However, replays show there was minimal contact in it, with Lacazette making the most of the challenge before Aubameyang got the chance to score from the spot. Could this poor decision end up having a huge say on the outcome of the battle for the top four this season?